Bharat 22 ETF by Government - Should you invest? Home » Mutual Funds » Bharat 22 ETF by Government – Should you invest? Bharat 22 ETF is a hot topic for discussion in the Investor community nowadays. Bharat 22 ETF is exchange traded fund launched by the government of India recently. The objective behind the launch of this fund is to boost up disinvestment initiative. This scheme will consist of 22 stocks of few blue chip private and public sector held by the government, that’s why it is designated as Bharat 22 ETF. Let’s try to answer your queries about – What are the key features of Bharat 22 ETF? What stocks will be part of Bharat ETF 22? Should you invest in Bharat 22 ETF? 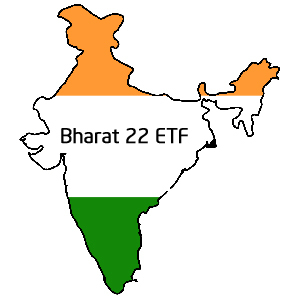 What is Bharat 22 ETF? Bharat 22 ETF is exchange traded index fund consists of 22 companies. It is a New Fund Offer (NFO) announced by the government of India. Date and other details of this NFO is yet to be announced. Demat account is mandatory in order to purchase this ETF. What are key features of Bharat 22 ETF? Bharat ETF will be formed with companies from 6 sectors. This includes sectors from Finance, FMCG, Energy, Basic material, and utility sector. This ETF will contain blue chip companies like SBI, IOCL, NTPC, ONGC, Coal India & Power grid. It will also include some private sector companies like ITC, L&T owned by the government. This fund will be traded on BSE and NSE. The return of this ETF will depend on the performance of 22 stocks. The Bharat 22 ETF will be managed by ICICI Prudential AMC while Asia Index will be the index provider. What stocks will be part of Bharat 22 ETF? Following stocks will be part of this fund. Bharat 22 ETF is diversified ETF comprising of 22 stocks from different sectors. Nearly 41% of corpus will be invested in 3 stocks L&T, ITC & SBI. All these stocks are from different sectors. Performance this fund mainly depends on 11 stocks majority holding – 85.5%. This fund is launched by the government. The 3 year return of CPSE ETF (launched earlier by the government) is very low nearly 3.85%. Average return of large cap fund consisting of above stocks is 12%. As it is NFO historical performance details are not available. After looking at above points a lump sum investing in Bharat 22 ETF, at the time of New Fund Offer, is NOT recommended at all.